Forbes has issued its annual list of the richest Americans and notes that things are going fantastically well for the nation's billionaires. A big stock market rally, a rebound in the real estate market, and rising values in the art market helped pump up the net worth of these 400 billionaires by 13%, Forbes said. Mayor Michael Bloomberg is among those with more dough, jumping to tenth place from the No. 12 spot with a net worth of $25 billion. Gates alone was worth $7 billion more than he was last year. 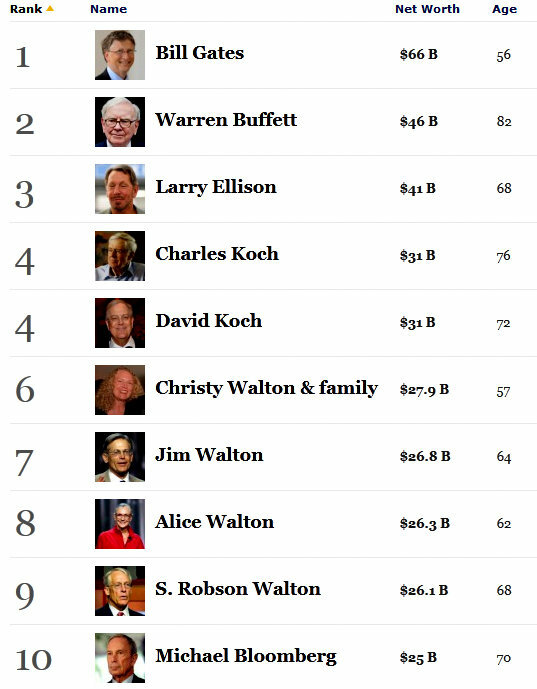 Berkshire Hathaway head and renown investor Warren Buffett again ranked No. 2 on the list, with his net worth climbing by the same amount to $46 billion. Larry Ellison, head of software maker Oracle, remained in the No. 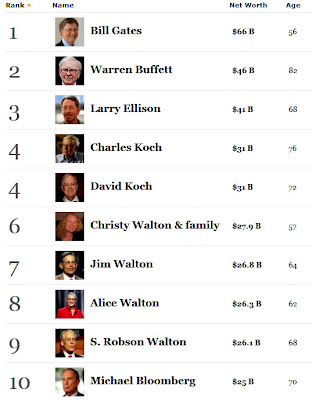 3 spot, but posted the biggest gain in wealth on the list, with his net worth rising by $8 billion to $41 billion. Two-thirds of the list’s members saw their wealth grow over the past year to an average $4.2 billion, Forbes said.